When you hear the phrase “Addiction Recovery,” it’s often connected to thoughts of self-denial and stringent discipline. But a new perspective on the treatment of addiction is trying to change the conversation: instead of removing an addictive substance from the subjects life through punishment, new research suggests that reward may be the stronger alternative. According to research performed by Dr. Suzette Glasner-Edwards of UCLA’s Integrated Substance Abuse Programs, addiction has as much to do with the presence of dopamine in a victim’s system as it does with the addictive nature of the substance in question. Indeed, the research suggests that a major cause of addiction is the increased levels of dopamine that alcohol or drugs have when compared to other stimuli. Glasner-Edward’s so-called “Behavioral Activation Therapy” focuses on replacing the triggers of dopamine in a subject’s system with healthier, but no less rewarding habits. According to Glasner-Edwards, one of the major reasons for relapse is the feeling of disappointment in routine pleasure, coupled with the seemingly joyless prospect of removing the addictive dopamine source from an addict’s life. Therefore, replacing the addictive stimulus is an important step on the road to recovery, which should be treated as an important health regimen in its own right. It is important to note, says Glasner-Edwards, that the recovering addict must be aware of the already established patterns of stimulus and behavior. For instance, if a certain situation is associated with substance abuse, it can trigger a relapse. There is no one way to address addiction and substance abuse. However, research such as Dr. Suzette Glasner-Edwards’ studies into the nature of addiction and association provide new tools for addressing the challenges a recovering addict faces. If you or a loved one is struggling with addiction or any other unhealthy behaviors, please contact us. We’re here to get you the tools you need. The Holiday Season is known by many as a happy time. If you look around this time of year, more often than not you’ll find pictures of smiling faces, the sound of laughter on the radio, and episodes of television full of cheer. But for many others, the holiday season is the beginning of a time of low energy, difficulty sleeping, and major depression. 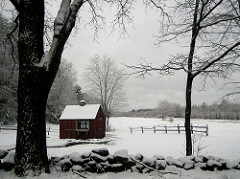 Seasonal Affective Disorder–the clinical term for seasonal depression–is a common occurrence in America, with over three million unique cases being reported each year. First formally recognized in 1984, Seasonal Affective Disorder is currently classified by the Diagnostic and Statistical Manual of Mental Disorders (DSM-5) as a recurrent major depressive disorder. As such, symptoms often include—but are by no means limited to—the feeling of hopelessness or worthlessness, having problems with sleep or appetite, and frequent pervasive depression, often punctuated by thoughts of death or suicide. Interestingly, however, the symptoms are brought on in autumn and often persist through the end of winter. According to the Mayo Clinic, the specific cause of Seasonal Affective Disorder remains unknown. Theories range from a serotonin deficiency brought on by a drop in sunlight, to an imbalance in melatonin levels causing instabilities in mood, to a simple misalignment of your body’s circadian rhythm leading to an unstable sleep schedule and the feelings of depression that result. Regardless of the cause, the impact is far-reaching and tends to become widespread in more extreme latitudes. Although the cause of the disorder remains unknown, diagnosis and treatment are well-known and effective. Seasonal Affective Disorder manifests in a number of ways unique from a typical depression diagnosis, including a hypersensitivity to rejection and a heavy, weighted feeling in the limbs. This, along with the unique timing of the disorder, has given clinicians the tools they need to effectively identify those who suffer from SAD, which in turn allows psychologists to properly address the issue. Treatments of SAD tend to line up with the treatment of depression in general, including talk therapy and medication. However, due to the theories regarding the cause of Seasonal Affective Disorder, a novel solution has presented itself in the form ofphototherapy, in which a light therapy box is used to expose your body to wavelengths of light that mimic the sun. According to the Mayo Clinic, exposure to such wavelengths of light seems to reverse many of the symptoms of SAD. Though research on the subject is limited, it appears to be an effective solution for many who suffer from seasonal depression. Whatever the treatment, the important thing is to know that you’re not alone, and that treatments exist. If you suffer from seasonal depression, it is possible that you have Seasonal Affective Disorder, and you don’t have to suffer alone. Contact us with any questions you may have. We’re here to help. The holiday season is quickly approaching, and though many call it “the most wonderful time of the year,” we’ve found that it can also be the most stressful time of the year. With family expectations, the kids back at home, traveling or guests, traditions to uphold, extra spending, eating and drinking, it’s no surprise that we often want another vacation after the holidays. Quite often, we succumb to all the extra pressure because we are trying our best to please everybody else. We try to find the perfect gift for a loved one, or we try to live up to our families expectations with the fanciest party. While it is often important to consider the needs of others, it is never good when that consideration comes at the expense of your own. With these suggestions in mind, you may be able to enjoy the holidays a little bit more, both for the sake of yourself and your family. One thing that quickly falls away during the holiday weeks is any semblance of a schedule. While it is hard to maintain a schedule with visiting family, travel, and holiday parties, it is helpful to identify what your obligations are, and what you have to do to keep yourself calm and happy. Is it your yoga class or other exercise? Or the hour in the morning by yourself? If those things rejuvenate you, don’t compromise! If you take care of those few things, you’ll be much more able to give during the rest of the day. It might be necessary, or it might not. But if the obligation is stressing you out, you’re strained financially, or you have too much on your plate already, you probably don’t have to do it. Consider setting that gift idea aside, or consider a more meaningful time–for both of you–where you take them out for lunch or buy them coffee. The holidays don’t have to be the only time you show affection for someone else. This can also be taken into consideration for feeling obligated to throw the best and largest holiday party, or hosting 15 of your relatives in your home because “they’ll expect it.” You’ll be surprised at what a release it is to politely decline or to suggest a simpler idea. At South Denver Psychotherapy, we are available for appointments both before, during and after the holidays. Don’t hesitate to give us a call (http://www.southdenverpsychotherapy.com/contact-us/). Sometimes simply opening up the weight of obligation can lighten the load immensely. In the last blog, we focused on identifying stay-at-home mom depression. It helps to realize that you are not alone in your experiences. So what can you do to counteract the depression? Here are a few tips to help you feel more accomplished about your day. Don’t start your day without a shower! With the baby crying all night, it may be hard to distinguish when your day actually started. But taking those short, 20 minutes to shower and put on jeans and a t-shirt can make you feel refreshed, clean and prepared for the day. It also opens up the option for you to leave during the day or have someone come over because getting yourself ready will be one less thing you have to do! Making this a priority every morning will do wonders for your self-esteem. Create a schedule or a checklist. You will be amazed at how scheduling your day changes the way you feel. If you have a schedule, you wake up every day with a purpose. We know that making an hourly schedule can be too hard with the baby’s needs. But what about assigning certain days to do things? Tuesdays can be laundry days, Wednesdays are for shopping and running errands, and so on. If making and deciding a schedule is too daunting for you, write a checklist every night for the next day. Think about what you didn’t finish, what you may have the energy to do the next day, etc. They can be very small things, like emailing your Mom, folding half the laundry, or texting a friend. As you check off those items, your sense of accomplishment will increase. Stop watching too much TV or spending too much time on the computer. Wasting your precious alone time on watching TV will only make you feel less accomplished. There is truth in the addictiveness of TV watching and internet surfing and it is a true time thief and brain washer. Indulging in this will only add to the downward spiral of feeling lonely and unproductive. Never turn on the TV or open your laptop unless you have a specific purpose in mind. Use your extra time to read a book, go for a walk, read to your baby or go to a park. This is where a checklist is extra handy. When you feel the urge to turn on the TV, go to the checklist first and see if there is something productive that you can accomplish. While these tips may seem simple, they will be a huge step forward in countering any stay-at-home mom depression. If you have any other tips to offer, leave a comment below! And if you need further help and suggestions, contact us for our counseling services in Centennial and surrounding areas. 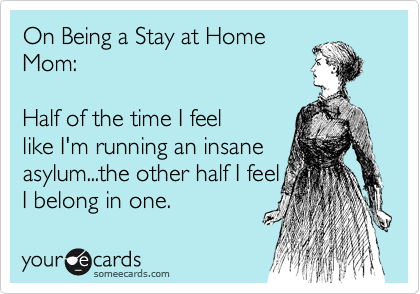 Are You Experiencing Stay-at-Home Mom Blues? Having a baby is truly a joyous and fulfilling moment. However, what about the mundane days to follow? 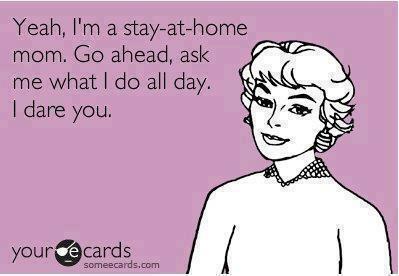 If you are a stay-at-home mom, this is quite a transition. On top of navigating the ropes of taking care of a baby, you also have the addition of lack of sleep, long open days with seemingly no finished tasks, being trapped at home, a drop in a social life and more. Gallup recently conducted a study of more than 60,000 U.S. women between the ages of 18-64 years old. This study found that 28 percent of stay-at-home moms admitted to depression a lot of the day. This is in comparison to only 17 percent of employed moms reporting depression. 41 percent of the stay-at-home moms also reported worry, compared to only 34 percent of their working counterparts. From this study, we can see that this is a real phenomenon. But what is causing it? As we have mentioned, there is an immense amount of change in parent’s lives after a child is born. While they gain something wonderful, the loss of their friends, income, status and life as they knew it is every bit as real. In contrast to working a job, being a mom is also a lot of unpaid work. It is 365 days a year with no vacation time, no paid time off and no breaks. This can result in utter exhaustion, mental breakdowns and being overwhelmed. Once a women becomes a mom, there is an automatic difference between her and her “non-mom” friends. Their lack of understanding can cause isolation and isolation can contribute to feelings of anger and depression. Some days, moms can’t even get out of the house and that means they receive no adult interaction at all. As wonderful as children are, only having conversations with them can be extremely isolating. In the working world, there are clear parameters, tasks and projects given. The work day has a start and end time and there are direct rewards to accomplished tasks. At home, the baby will continue to cry and need a diaper change, food still needs to be cooked, and the laundry and housework will keep piling up. This causes a great lack in a stay-at-home mom feeling appreciated, understood and connected. The first step to help is recognizing that this is normal! In our next blog, we will discuss some tips to counter stay-at-home depression. If in the meantime you need help, don’t hesitate to set up an appointment with a Denver psychotherapist today.